Can people with Diabetes eat desserts? People with diabetes often think they need to totally steer clear of desserts. But, the fact is that while it is important for diabetics to control their calorie and sugar intake, they can still have some aptly prepared desserts, occasionally, in limited quantities. They can make better options or learn the art of making sweets/desserts in such a way that it is safe to be consumed and diabetes is managed. Birthdays, festivals or parties, no special occasion is ever complete without desserts! This section will take you on a beautiful ride, which guides you through some of these lip-smacking desserts. Carbohydrate Control Plays a Key Role in Diabetes Management. The term carbohydrates include complex carbohydrates, sugar and fibre too. Your blood glucose levels are not only affected by sweets in your diet but also the quality of the carbohydrates. Simple carbohydrates like sugar, honey, fruit juices, corn syrup and processed foods can immediately spike up your blood glucose levels and hence, should be avoided by diabetics. Desserts like cakes, pastries, cookies, puddings, ice-creams and candies contain high amount of simple sugars. Desserts for diabetics are usually made with artificial sweeteners and sugar alcohols. But this isn’t an ideal solution. Sugar substitutes are low in calorie or may also be calorie free. Research data reveals that sugar substitutes may alter healthy gut bacteria. Moreover, artificial sweeteners are 100 times or even more, sweeter than sugar will leave you craving for more sweets. These days low sugar sweets and desserts is available in many sweet shops and restaurants. 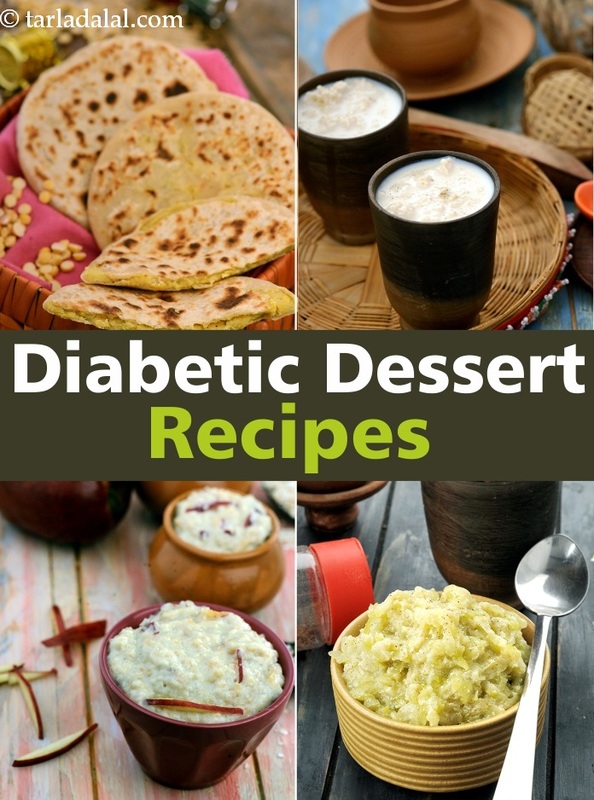 But if you’re craving for sweets then you can make delicious diabetic friendly recipes at home. All you need to do is a wise selection of ingredients. Home-made sweets are a healthier version of regular sweets because you will know the actual amount and type of ingredients used in that particular dessert. 1 Substitute whole milk with low fat milk or skimmed milk. 2. Substitute regular paneer with low fat paneer, butter with low fat butter. 3. Eat whole fruits instead of fruit juices and milk shakes. 4. Replace sugar with natural and low Glycemic Index (GI) ingredients like honey, jaggery, dates, figs and other fruits. 5. Include a lot of fibre in your diet in the form of fruits. 6. Use artificial sweeteners only if necessary. 7. Consume a protein rich diet to control diabetes include ingredients like milk and paneer. 8. Cut down your carbohydrate in meals to make place for desserts if you’re craving. 1. Paneer Kheer is a healthy yet tasty recipe made with low fat paneer and sugar substitute and is also rich in calcium. 2. You can try our fibre rich Apple Pancake which is low fat and made with whole wheat flour instead of refined flour. 3. A calcium rich recipe like Oats Apple Phirni is a low calorie and low fat dessert, perfect to top up your calcium requirements. 4. If you are a fan of Indian sweet preparations than Lauki Halwa is a must try as it is low in calories and carbohydrates. 5. Kids will drool over this Chocolate Pinwheel dessert. This recipe is a healthier version of the regular one but is as delicious. 6. You can use natural products as sweetener like dates used in the recipe of Date and Apple Kheer. This recipe is free from rice and is definitely a good treat for occasions like Eid, Navratri and Parsi New Year. 7. Diabetic Caramel Custard is a lovely recipe to try if you’re craving for something sweet. This recipe uses minimal amount of sugar and is prepared from low-fat milk. 8. Another delightful recipe is Sugar Free Date Rolls , a rich and unique combination of dates, almonds, pistas and walnuts and I bet you cannot miss this one. 9. Who doesn’t love ice-creams? Here’s a fabulous diabetic friendly recipe of Sugarfree Strawberry Ice cream. For a sweet and chilled affair. 10. Ever heard of a healthy lolly? Well we have this marvelous recipe of Strawberry Lollies. Wondering what makes them healthy? We have added a lot of healthy ingredients like oats, skimmed milk powder, low fat curds and cream to add to its nutrient value. Disclaimer: It is highly recommended that these recipes be relished by diabetics only occasionally and in small quantities. This is just a mere ‘treat’ and does not qualify for a regular diabetic menu.